When the term "Lottery" comes to mind it gives us an image of huge money earned out by chance without any significant effort. But the concept of "Lottery" is used not only for winning money, wealth or privileges, it is also at times used for thing that has (no way) any relation to wining or anything! Kumar, a jovial banker never knew that one such lucky draw will bring a yearlong nightmare to him that will redefine way of his living. One can think of it as a coincidence or be of any undefined phenomenon, the branch of the bank which Kumar had been transfer recently as Branch manager, had been witnessing, unnatural death of three of its employees in a span of just two years. A clerk who had been working long for 15 years, died of choking his throat when he was having quick breakfast to the office. Another case was of the cashier who was all healthy and stout, fell sick of seasonal diarrhea and passed away for dehydration. Where as an woman employee who had briefly joined in probation killed herself, for some personal failure in her love interest. She hardly worked for a week, before she killed herself!. It was believed the previous branch manager did his best to take a transfer and given a handsome bribe or so, to his higher official to take a off time transfer. Poor Kumar was replaced in his place. The day he joined, that to in a short notice, he was coldly greeted by the staffs of the bank. The 1st letter he was kept in front of him to sanction, was of the leave letter of Sr. clerk, Haldhar Shau. Kumar was happy to sanction it, but he asked for a week long leave. He was the only senior member, who can make him acquaint of the balance sheet of the bank. He rejected it. The clerk was almost in tears. "Ok Ok! Just wait for two days and explain me the asset and liabilities list here." Kumar Requested. "Why, two days sir, if you are willing today I will explain everything today only! it's only a small branch", the clerk said in hurry and added," If required I will stay late in the evening and ask all the staff to work till you get a sound information of the bank"
"I don't like people working late in bank, when it is not necessary", Kumar said. "We will try to finish the work before time sir" Halder affirmed. Kumar was happy to see the workaholic staff of the bank. Kumar was settling down, he heard another knock at his cabin door. A short man in khaki dress entered with cup of tea in a tray. and kept the cup of tea on the table. "Happy to meet you Sunder"
"Thank you Saare.....Saare you know...."
Sundar was about to tell something. Haladhar entered cabin of Kumar with four other staff members of the bank to introduce themselves to Kumar. Two of them, Ravi and Bimasena introduced themselves as junior clerks and a woman, Banita in late thirties, introduced herself as the cashier. A young man, Rockey Das in his mid twenties, introduced himself as office boy. "Rockey!, a Filmy name as I have got! Ha ha !" Kumar told in jest. The team tried their best give fake smiles on Kumar's remark, which Kumar also noticed. At the end Sunder, introduced himself as office peon once again. As he introduced himself, Haldhar and Sundar exchanged glances. Kumar marked, Halader shook his head side wise, maybe he was warning Sundar to keep quite. The day went on quite good. At the end of the day, Kumar realized from the documents that, there were Two people who had recently worked and no longer are working. The third one was of a lady, whose all documents has silly mistakes. "Who has done this? "Kumar asked, Haldhar"
"Is she on Leave or transferred?" "No Sir, She is dead"
"What about other two, I also see entries in different documents?" "What? !, are you joking? ", Kumar was perplexed. "Sir, Something unnatural is happening with this branch, three of our staff died in just in span of two years." "When this bank was established?" "Sir, four years back only"
Kumar could understand everything. The reason behind his midyear transfer. "Are you taking leave, for the same reason, Haldhar babu"
"No! but My family insists..they want to do some Puja near a great Baba in Kendrapada. We are his devotees"
"Ok I understand" Kumar said as he wrapped for the day. A Strange day indeed, for him. Kumar, could not sleep well in the guesthouse. There was a strange uneasiness. He called his family in the evening, but kept the details happening at bank to himself. For next few days, Kumar tied to cheer up his staff and tried to keep them all in good mood and at times cracked jokes, as his nature was. It was one afternoon, on 4th August, 2014 at the launch break, Kumar offered a party, at the nearby town restaurant. It was good outing and food served were delicious. At end of the meal, every one greeted thanks to Kumar. And it was one of the staff member, Bimasena emotionally uttered, "who knows who is next? If it were me...", and started crying. Kumar tried to console Bimasena. But he was inconsolable. Sundar tried to calm him off and gave a suggestion. Why don't we take lottery draw. And see who is next. To which Kumar also agreed. Names of the staffs were written including Kumar's in a separate sheets and those were shuffled. Name of Haldhar was also written even though he was on leave. Since Kumar was the boss, he was asked to lift the chit. Happily Kumar picked one chit and gave it to Sundar to read out. "who is it? "every one asked. and looked at the crying Bhimasena, he was almost about to faint. "Read out Sundar", Kumar ordered. "It is you, Saare, Kumar!!" There was a flash of broad smile on the face of Bhimasena, which quickly turned to fake concerned face. He was trying to pretend that, he was sad for the Boss! Kumar laughed out loud and said, "Now happy, my dear friends, it's me next, till I am alive and not dead, do you sincere job and call Haldhar to join immediately, he will be happy to hear about it"
Next day, at the office there was new energy and the bank looked lively. Even Haldhar reported for the Job and greeted good morning to Kumar with a broad smile. "Sir, Baba is great, you see his miracle, the cloud of despair has disappeared. But he said it will transfer to some other nearby, You must go to Baba with your family" Haldhar said. "If it again transfer back to you, let the fate be with me! at least you people will work with good spirit." Although Kumar never believed in such stuff of such evil happenings, but he was indeed psychologically affected. He thought of his family about his two adorable kids and his beautiful wife, who he has left behind at Cuttack. As he sat in his cabin and off from work for some times, he started thinking if he dies, say may be in a year, of some unknown reason, what would happen to his family?. "Let's take a challenge, let's see how death comes if it all comes", Kumar said to himself and circled the day when the lottery was done in his pocket calendar. He decided to keep a track till a year completes. Every Morning he woke up, he would strike off the previous day. For few following months he did his best, to be careful in every aspect of his life. Say while crossing the road, taking preventive percussions to disease like malaria, flu and daily safe exercise and good diet. But later, when months to the marked day neared, Kumar was psychologically drained. His work efficiency at the office reduced and his jovial attitude became sober and dry. He developed phobias for a lot of things. From Acousticophobia to Xenophobia!. But in contrast his staff enjoyed their days, Bhimasena applied for LTC Leave to some hill station, Haldhar became staunch devotee of the Kedrapada Baba filled his desk with stickers of the Godman, which he said was the 11th incarnate of Lord Vishnu!. While Sunadar tried his luck in lottery tickets and others had own forms of enjoyments and every one even forgot any such event had happened where they have played lottery to death! It was during Kumar's family visit to spend summer holidays with him in May month or so, Kumar's wife discovered his disturbed behavior. It was one night, while asleep, Kumar wildly cried for help. When he was pacified by his wife and waked him off. He was all in sweat and just told his wife to ignore it, telling it as bad dream. Kumar's wife insisted him to tell her anything that is troubling him. He all Said "everything is fine". But She knew, something was wrong, but may not of serious concern. When August month came, Kumar thought to take a week long leave to Cuttack. He was certain something bad is going to happen with him before 4th of August. He may die!. So he decided to spend the time with the family. His kid were happy to see him at home. His wife prepared good dishes for him. He was feeling at peace. Finally the day of 4th August came after a long year, and any how he spent the day sleeping lazily. In the evening, when his wife was offering cup of tea to him. "DHOOO%%@##$" All of a sudden someone fired a cracker! Kumar Cried, "Ah Ah" in shock as his heart throbbed faster and tea cup fell on the floor. "What Happened? ", asked his wife, perplexed with such behavior. "Someone just fired some crackers"
As she pacified Kumar, who was fluttering like leaf. They heard chaos outside the streets. People were tearing down the Poster of the Kendrapada Godman. When they switched on the TV, all news channels were airing the Fall of the self styled Godman of Kendrapada. Kumar remembered of his office staff Haldhar Sahu, a staunch follower of the Baba. Kumar laughed out loud and he laughed continuously for some minutes. His wife was out of clue what was happing to him. Has he gone mad?, she thought. "Yes, I was not ok, for year or so, But I am now"
The Day of 4th August, 2015 passed away, as any other day in the life of Kumar. Kumar returned to his branch the other day boasting to say, "A year and A day has Passed! and I am fine, Even if I die now, I will not blame the omen or the foolish lottery you all believed in, I believed in!" He looked at Haladhar and said," Haladar Babu, the fate did transfer to someone nearby, and it was onto your Baba himself." "Here on I wish, I may not hear such silly excuses in work." Kumar was back in his happy going nature. Dedicated to My father-in-Law, Mr. Kumar Mallick, A banker who had similar experiences in past. 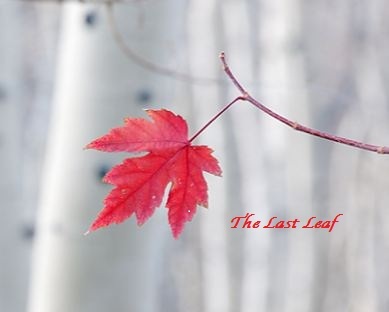 And remembering "The Last leaf " by O Henry.